Horseman’s Hollow returns for 16 evenings of highly entertaining haunted mayhem, taking the tale of “The Legend of Sleepy Hollow” to its darkest extremes. 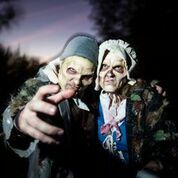 Philipsburg Manor transforms into a terrifying landscape ruled by the undead, the evil, and the insane. Begin by walking a haunted trail, stumbling upon scary scenes of a town driven mad by the Headless Horseman. Enter the terrifying ruins of Ichabod’s Schoolhouse, a twisted maze of horrors too terrible to describe, and the lair of the Horseman. Heads will definitely roll…maybe even your own! Fast Track ticket holders queue up in a separate entrance from general admission ticket holders, and they are let in FIRST in their time slot.